If you are looking for a favor idea that guests will be able to use again, then I have just the thing for you. 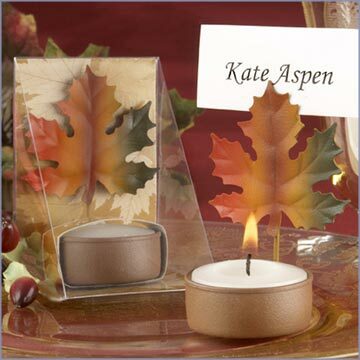 These fall themed votive holders are a perfect favor idea for a fall themed wedding. Guests will be able to use these decorations every fall. Each season when they pull out these fun candle holders they will be reminded of your wedding. It is the gift that keeps on giving! Okay…I know, that was a bit cheesy but it is true! J Check it out! 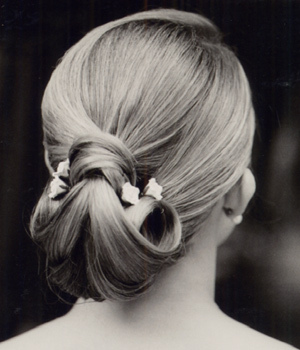 Elle.com has this great hair style on their site and I had to share it because I love it so much! It almost makes me wish I had long hair so that I could achieve this style. It reminds me of something from the 50’s and 60’s and it was actually inspired by the film Hairspray. However we have seen versions of this hair for a long time coming down the runways and this style seems to stay classic and beautiful throughout the years! This style is perfect for a for the bride or even the bridesmaids. Halloween wedding favors can be anything from and whimsy to rich and elegant. However, this is the theme that you can go all out with and have tons of fun with. Plus, I am guessing if you are having a Halloween theme you have a fun loving personality anyway. So here is my list of options for favor ideas that really capture the theme! Get glass slipper favor dishes at your local craft store and paint them black and decorate them like a witch’s shoe. Then, fill the witches shoe with candy and place them at each place setting. Your guests will laugh at your creative spin on a typical wedding favor. You can always buy Halloween candy molds and make candies or suckers for each of your guests in spooky Halloween shapes. This is a fun Halloween wedding favor, and one that doesn’t have to cost much. Guests always appreciate something that is made or has a personal touch. Candles always make a great Halloween wedding favor. You can buy witch hat shapes votive holders and candles online or at party stores for about a dollar each. These cute candles can be placed at each place setting to double as both decoration and favors. Little tombstones can be made or found at craft, hobby, or party stores. These tombstones can be personalized for each person and placed at each place setting, and then taken home as memorabilia. A lot of places now sell small tombstone shaped boxes that can be filled with candy or other goodies. There are also fake pumpkins now that can be carved. You can buy a small one for each place setting, carve it with the persons name in it, and then have them take it home to set outside their home for Halloween for years to come. Some of the best Halloween wedding favors are those that keep on giving. Since it’s Halloween, fill small paper trick or treat bags with the orange foil covered chocolate pumpkins and other candies. You can also set up a candy bar with fun Halloween candies and give each guest a trick-or-treat to gather there candy in. Purchases small jars of pumpkin butter and give them to each guest. It’s like pumpkin pie in a jar and it’s great on biscuits and crackers. Check with a local baker to see if you could have miniature pumpkin pies made or make them yourself. Wrap in cellophane and tie with orange/black ribbons. Simple, unique and delicious! Give each guest a mini loaf of pumpkin bread to take home. It is delicious and gives them something to munch on when they go home. If you are looking for a fun unique wedding favor, why not give them caramel apples. Caramel Apples are fun and festive for a fall themed wedding. You can dip them in peanuts or just leave them plain. 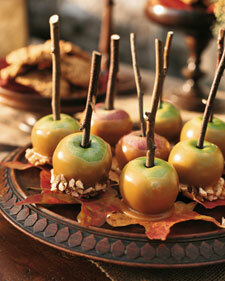 Serve these apples as part of a desert buffet or candy ball and place them on top of silk leaves as pictured above. Another option is to place the apples on a sheet of wax paper, gather at the top and tie with ribbon and a few leaves. Easy, simple, fun, and oh so cute! Insert a 5-inch dowel or ice pop stick into the top of each apple. Place hazelnuts in a small bowl. Place sugar, corn syrup, cream, and butter in a small saucepan, and bring to a boil over medium-high heat. Continue cooking until the temperature registers 245 degrees.on a candy thermometer, 10 to 12 minutes. Fill a large bowl with ice water. Remove saucepan from heat, and briefly plunge it into ice water to stop the cooking. Dip one apple into the caramel, coat the top and sides using a spoon, and roll the bottom in the nuts. Transfer to a serving platter. Repeat with the remaining apples. Wonderful for an afternoon wedding, perhaps one held outdoors, this display is inspired by seasonal fruits and reminiscent of a farmers’ market, right down to the handwritten labels. Lots of late-summer produce is used here, but every season has its bounty (in the winter, citrus fruits and pomegranates are fitting). 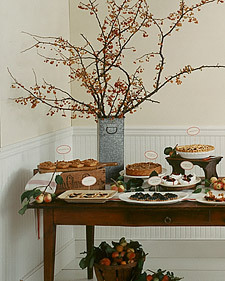 In a galvanized vase, branches bearing tiny crab apples reflect the natural theme. Crumbly tarts, a lattice-topped pie, and meringues with syrupy fruit are right at home on this rustic table. A square buttercream wedding cake is adorned with apples, peaches, pears, plums, and currants to soften its edges and give it a charming appeal. The tea-towel runners, old-fashioned cake stands, sturdy white dishes, and wooden boards and crates used to display them are straight out of a farmhouse kitchen. Even an antique footstool becomes a pie stand. Since the fruits are full of flavor, they lend themselves well to simple desserts. 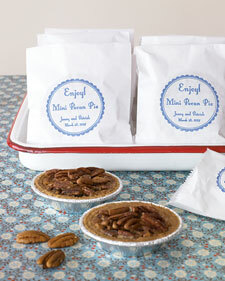 You could have these sweets catered, or ask loved ones to bake their favorites. Having a fall themed wedding? Well if you are, why not extend your theme to you drink selection? Serve your guests hot apple cider with a few cinnamon sticks in the glass for a little whimsy and fun. 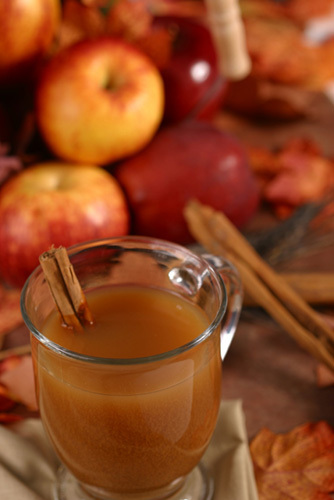 The hot apple cider will warm your guests from the inside out and will help set a warm and cozy atmosphere. 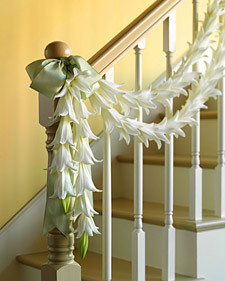 Perfume your ceremony or reception site with a garland of sweetly scented lilies. The sturdy flowers are abundant in spring. For a long space or a double-layer strand, have your florist wire several garlands (it’s best done the day of the wedding). Hang lengths of up to 16 blooms each in sections; each swag shown at the left is an individual garland, as are the two vertical sections. Be sure to leave extra wire for hanging; you can hide this wire with wide satin bows. Lily pollen often stains; you may want to remove the yellow anthers. What do you give as a fall wedding favor that still allows you to stay true to your theme? How about Maple Syrup! 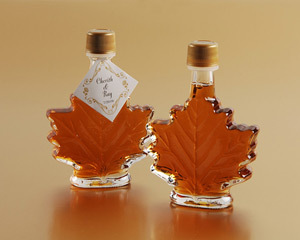 This maple syrup comes in these cute little leaf shaped bottles. Plus they are the perfect color for any fall themed wedding. These would especially go over well if you where getting married in a cabin or cottage, or even outside. You could even pair this favor with a nice gourmet bag of pancake mix. You guests are sure to love you then, because you just gave them breakfast for the next morning! Check it out!